Conroy had started his career in his native Scotland with Clydebank before moving on to St. Mirren where a quick burst of four goals in nine games earned him a move to Reading. Burnley had set their sights on a new striker and that had become more urgent with the news a week earlier that Ron Futcher had been released. 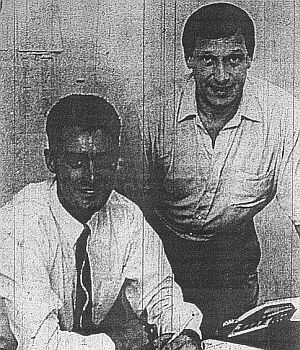 Conroy's signing left Casper delighted and he said of the player who had cost us £40,000: "Mike's a big player right out of the Billy Hamilton mould and he will be a great asset to us. He's over six feet tall and he's busy and aggressive in the box - just the sort of player we need." It was only the start for Casper as he set about building a squad that would go one better than in the previous season and he confirmed that we'd be making a bigger offer for Preston midfielder Warren Joyce. "Warren is interested in coming to Burnley and we will be going back to Preston with a new bid," Casper confirmed. "He is another player who can do a good job for us and we will be going through all the proper channels to try and bring him here." Casper said that there were other players he could target if he wasn't able to get Joyce and he also said that he would bring in replacements for Steve Davis and Ian Measham should either of them eventually leave. Both players were still on week-to-week deals and Casper admitted: "While both Wolves and Barnsley have made enquiries about Davis neither have made a bid for him and no one has come in for Measham either. "It's not practical to have too many deals going on at any one time, but if either Davis or Measham goes I have players in mind to fill the gaps." Casper also suggested that he wouldn't be looking for a winger. "We surprised a few teams by playing three strikers towards the end of last season and John Francis can play a wide role. "The idea that you have to hit the touchline to make good crosses is outdated now. By playing three central defenders or a sweeper we release full backs into attacking positions and midfield players like Joe Jakub and John Deary have both proved that they can make the right sort of diagonal crosses. "A big centre forward like Mike Conroy gives us even more options and now we just want to get on with the job in hand, getting out of the Fourth Division." The players were just days away from returning for pre-season training and would then leave five days later for Russia before returning for the traditional Lancs Manx Cup. And another date had been added to the diary with the draw for the first round of the Rumbelows Cup which had paired Burnley with Third Division Wigan Athletic with the first leg at Springfield Park.